The John Trigg Ester Library invites you to attend the April installment of its monthly Library Lecture Series Wednesday, April 29, at 7 p.m. in Hartung Hall in downtown Ester. 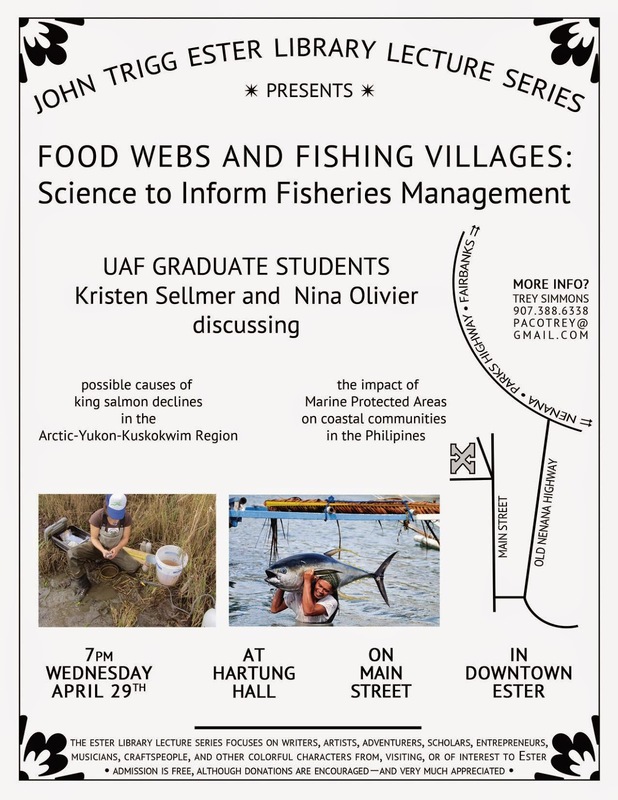 This month’s lecture is “Food Webs and Fishing Villages” and features University of Alaska graduate students Nina Olivier of SNRE and an intern with the Yukon River Drainage Fisheries Association Project, and biology and wildlife student Kristin Sellmer, who will discuss how science can inform fisheries management and subsistence fishing in both Alaska and the Philippines. As always, the lecture is free and open to everyone. For more information, call 388-6338 or visit the library website at www.esterlibrary.org.